The House Environment Committee will be holding a hearing at the rise (around 4:30 pm) on Thursday on three bills. One of those bills, H7195, would direct DEM to establish trails on state-land for 4 wheeling. There are problems with this legislation: user conflicts, land management challenges, and other issues as they relate to allowing 4 wheeling on DEM/state land- or more broadly on land protected/procured using federal and private funding that restricts such a use. The challenges to establishing 4 wheeling trails on DEM land are numerous and would add responsibilities and costs for DEM at a time when resources are being reduced. The Rhode Island Department of Environmental Management will hold its second event for the 2011 Great Outdoors Pursuit at Haines Memorial State Park on Sunday, June 12th from 11:00 a.m. to 3:00 p.m. The event will have a host of activities geared towards children and their families to encourage outdoor play and more physical activity. Children will be able to touch and feel sea creatures captured in Narragansett Bay at the EPA's touch tank, create art using seaweed from Rhode Island beaches, climb a 35-foot rock wall, and bike, walk, or rollerblade on a picturesque stretch of the East Bay Bike Path! East Providence Cycle and REI will also provide free bike safety checks and tune-ups to registered participants. A full list of activities and schedule appears below. The event is free and open to the general public but teams that register for the Rhode Island Great Outdoors Pursuit are eligible for raffles. Registration is free. For more information, visit www.riparks.com , contact Terri Bisson at (401) 222-3434, or email RIparks@dem.ri.gov. The roses are ready to be uncovered from their long winter naps. This Saturday, April 9th, the RIRS will gather around 9:30 a.m. at the garden (rain or shine) to open up the RWVRG for the season. The weather report is for partly sunny skies with highs in the low 50's. Perfect weather to open up the garden. Come out, and be with all of your friends from the RIRS and talk about your favorite flower. There is plenty to do to get the garden readied for the upcoming season. The more people we have helping out, the sooner it is done. Volunteers are needed for pruning, and cleaning, and raking, and fertilizing, and we have many new roses need to be planted. No experience needed! Just a love of roses, the RIRS, and the RWVRG. P.S. This is a rain-or-shine event, but in the event of severe weather, contact me at 401-663-3777 for cancellation and postponement information. Is there a cleanup or celebration for Earth Day in your Rhode Island community this year? Are you celebrating Arbor Day in Rhode Island this year? Many groups have already added their events to the What Grows On in RI Earth Day/Arbor Day calendar, but I'm sure there are lots more! Add your event to the most complete listing of Earth Day and Arbor Day events in Rhode Island! 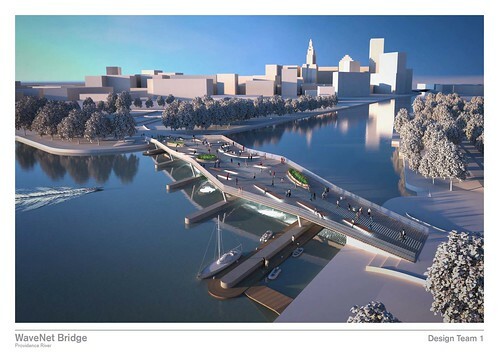 Have you viewed the design proposals for the Providence River Pedestrian Bridge that will be built on the supports of the old I-195? Drawings and descriptions are up on Flickr, and discussion is raging there and on Greater City Providence. You might have thought that a bridge is something that takes you from one side to another, but many of these designs are destinations in their own right. Take a look and comment! This is a $2M-$4M project, and once it's built, it's built. The winning design is to be announced at the end of NOVEMBER. If you don't want to join Flickr or leave a comment on Greater City Providence, send email to the Planning Department through their online contact form. On November 2, 2010, 64.4% of voting Rhode Islanders approved Question 4, the Open Space and Recreation Bond Issue. These videos explain why this money is necessary and how it will be used. Mark Garrison, a founder of The Rocky Point Foundation, explains why voting yes on Question 4 is so important to Rhode Island. Watch. Eric Hertfelder, director of the Fort Adams Trust, explains why voting yes on Question 4 is so important to Rhode Island. Watch. David P. Riley of the Head of the Bay Gateway project explains why voting yes on Question 4 is so important to Rhode Island. Watch. Don’t miss this chance to celebrate the old Rocky Point Amusement Park and help make sure the wonderful memories will live on in a Rocky Point public park preserved for future generations to enjoy! Featuring recycled Halloween Costumes by renowned local designers, a silent auction, art show, Hors d’oeuvres and a cash bar. All costumes will be available for auction … get ready for Halloween! All proceeds to benefit Groundwork Providence. Have you and your family and friends been to one of the Great Outdoors Pursuit days? These are great fun for the whole family. At least one child is required on each team, and even if you don't participate in the ongoing game aspect of these free summer activities, you are welcome to come and enjoy Rhode Island's Great Outdoors. The next event is Sunday, July 11, 11am - 3pm, in Arcadia Management Area. There will be guided hikes, kayaking, fishing lessons, rock climbing, tree ID, a forestry obstacle course, and geo-caching, plus Smokey the Beat will show up. PROVIDENCE – Department of Environmental Management Director W. Michael Sullivan, PhD announced this year's America the Beautiful tree planting grants at the state Arbor Day program held today at Central Falls High School. The grants will result in the planting of over 130 trees throughout much of the state. In the past 19 years, DEM's Division of Forest Environment has awarded more than $2.25 million in America the Beautiful grants, matched by over $3.6 million in local funds. The Arbor Day ceremony featured a speaking program, a presentation by students at Central Falls High School, and the planting of a red oak tree at the school. The program is a prelude to an Arbor Day Fair that will be held on Saturday, May 8 at Warwick City Park where the RI Tree Council, in conjunction with DEM’s Division of Forest Environment, Arpin Group and National Grid will plant 110 trees. This year’s state Arbor Day program coincides with the Blackstone Valley Tourism Council’s 25th anniversary. The Council operates on the philosophy that sustained economic development in the region must rely on sustained historical preservation and environmental protection. To that end, the Council has promoted the region to residents and visitors by emphasizing the area's rich “farms to factories” heritage, cultural diversity, and ecotourism opportunities. Twelve grants, totaling $30,000 and matched by $53,882 in local funds, will be used for tree planting, educational programs, municipal tree nurseries, and comprehensive street tree inventories.